Are you a Pokemon fan? It doesn't really matter, but I am sure you've seen or heard about the latest mobile game craze, Pokemon Go! Currently available only in US, Australia and New Zealand. Fans from Asia got to wait a bit as the game was delayed its launch in the Asia. Pokemon Go has broken all sort of records in the US game app markets. It is free to download in iOS and Android phones and nicely blend in the real and virtual world for the fans (or players) to catch the pokemon creatures in "real life". It's kind of like fantasy comes true for the Pokemon fans. 1. Good thing takes time. Do you know long it takes for the creator, John Hanke to create this app? Not 1 year, not 5 years but 20 years. Yes, he started mapping the world of Pokemon since 1996, while he was still a student. Just like any investment, it takes time to bear the fruits, so be patience and have faith in your dream or investment, as long as you've done your home work. As the saying goes : time in the market is more important than timing the market. 2. There is no need to re-invent the wheel. 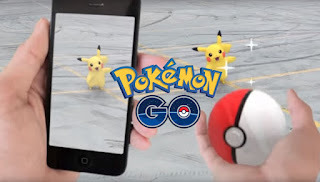 Do you know that the Augmented Reality game concept of Pokemon Go is not something new? Before Pokemon Go, there was Ingress, even though not as popular. Besides, the graphic and design of the pokemon looks average to me too. Just like in investing, there are enough strategy for the retail investors to adopt, there is no need to reinvent the wheel by coming up with brand new strategy. All roads lead to Rome, just find one or two that suit you. 3. Luck is important! I believed no one, not even the creator, John Hanke has envisaged such a crazy success of his game. What can I say? I believed luck do play a part in everything. Just like in investing, you might have done your 101% research and homework in studying the stock(s), but at times, you still need a fair share of luck in turning it into an hit. Would you have a go on Pokemon Go when it is available here? For me, I am not a fan of games but will definitely give it a try just to have a first hand experience of this phenomenal craze.